US Congress seeks to strengthen defence partnership with IndiaIn a joint conference report, which aligned the two different versions of the bill, the House and the Senate said the United States should strengthen and enhance its major defence partnership with India, and such a partnership should enable "strategic, operational and tactical coordination between our militaries, and be jointly developed between the countries".PTI | Aug 2, 2018, 09:18 IST WASHINGTON: The United States Congress has passed the $716 billion defence spending bill which, among its many provisions, seeks to strengthen and enhance the country's defence partnership with India. 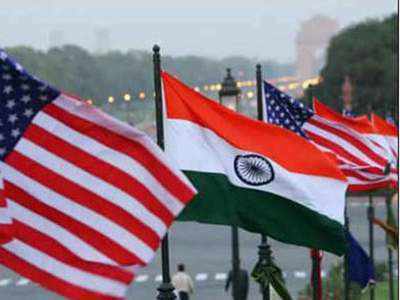 India was designated a major defence partner in 2016, towards the end of the Obama Administration's tenure. It also said the United States should work toward mutual security objectives by expanding engagement in multilateral frameworks, includi ng the Quadrilateral Dialogue between the United States, India, Japan, and Australia, to promote regional security and defend shared values and common interests in the rules-based order. According to the bill, the Congress believes that the United States in coope ration with Japan, India, Australia, and other allies and partners, should work to uphold the values of a free and open Indo-Pacific region and promote regional security and stability through appropriate cooperation regarding the rule of law, peaceful resolution of disputes, maritime security, non-proliferation, and counterterrorism. Get latest news & live updates on the go on your pc with News App. Download The Times of India news app for your device. Read more India news in Englis h and other languages. Jobless single mom is struggling to keep her daughter alive. 15-year-old will die of Deadly Cancer without Help!